Drivers in some cities are disproportionately affected by these costs. For example, you are more likely to encounter a drunk driver in Tulsa, Oklahoma, than in San Francisco, California. Even so, the cities with the highest number of fatal alcohol-related vehicle crashes per capita aren’t the cities where drivers see the steepest auto insurance increases after receiving a DUI. Using data from the National Highway Traffic Safety Administration, NerdWallet analyzed the 150 largest U.S. cities and found the places with the most fatal alcohol-related car accidents per capita. We also used NerdWallet data to find the average car insurance premium increase drivers will have to pay after receiving a DUI. At the national level, we found no correlation between cities with high rates of fatal crashes involving alcohol and cities where drivers experience steep car insurance increases after they receive DUIs. Six of the 10 cities with the most fatal alcohol-related car crashes per capita are cities where drivers see relatively lower car insurance rate increases after they receive DUIs. The national average annual car insurance premium increase after receiving a DUI is 75.3% a year. However, the range of percentage increase varies greatly. For example, drivers in San Bernardino, California, see a 135.06% increase each year, but drivers in Omaha, Nebraska, see a 3.76% increase. The national average dollar increase for insurance premiums after a DUI is $857.53 a year, but the extra cost can range from $5,996.20 in Detroit, Michigan, to $45.26 in Omaha, Nebraska. For a full ranking of the 150 cities analyzed in this study and to download the raw data, click here. San Bernardino has the most alcohol-related fatal crashes per capita of any city in the U.S. In 2010-2012, there were 92 fatal crashes involving drunk drivers. With a population of over 210,000, San Bernardino has nearly six times as many alcohol-related crashes per 1,000 residents, or 0.4368, compared to the national average of 0.0731. San Bernardino residents who get DUIs also face hefty car insurance increases. On average, they can expect to pay $1,282.43 more a year, or about $400 more than the national average of $857.53 a year, for car insurance after a DUI. From 2010 to 2012, Mobile recorded 58 fatal alcohol-related crashes. For the city of about 195,000 residents, the number of fatal alcohol-related car accidents per capita in Mobile was about four times the national average. Augusta, Georgia, which has about the same number of people as Mobile, only had 17 fatal alcohol-related crashes in the same period. Compared to drivers in other cities, Mobile residents face much smaller annual car insurance increases after receiving DUIs. On average, Mobile drivers pay $1,014.88 a year for car insurance. After a DUI, Mobile drivers can expect to pay $476.75 more a year, an increase of 46.98% for car insurance premiums. Riverside, about 14 miles south of San Bernardino, is the city with the third-highest number of fatal alcohol-related accidents in the nation. Riverside had about three times the number of fatal alcohol-related crashes per capita compared to the national average from 2010 to 2012. Drivers in Riverside who receive DUIs will face slightly steeper car insurance rate increases than San Bernardino drivers. The average Riverside driver pays $1,001.94 a year for car insurance. After a DUI, that number jumps 140.16% to $2,406.25. Tulsa, which has about 390,000 residents, had 74 fatal alcohol-related accidents from 2010 to 2012. Oklahoma City, which has almost 200,000 more residents than Tulsa, also had 74 alcohol-related crashes during the same period. Drivers in Tulsa face below-average insurance rate increases after they get a DUI. Tulsa drivers can expect to see a 42.34% increase in their yearly car insurance rates after a DUI. The average driver pays $1,472.03, and will see yearly premiums increase to $2,095.36 after a DUI. Lubbock had 40 fatal alcohol-related deaths from 2010 to 2012. Since Lubbock has about 230,000 people, that means the city had 0.1743 accidents per 1,000 residents during that period — more than twice the national average. On average, Lubbock residents pay $1,128.53 for car insurance. After a DUI, the average Lubbock driver’s insurance rates will go up about 55.34% to $1,753.01 a year. From 2010 to 2012, Knoxville recorded 31 fatal alcohol-related crashes — three times as many alcohol-related accidents per capita than the national average. Although Huntsville, Alabama, which is just across the border, has nearly the same population (about 180,000 residents), it had only 12 fatal alcohol-related crashes in that time. Compared to drivers in other cities, Knoxville residents face much smaller car insurance increases after receiving DUIs. On average, Knoxville drivers pay $1,019.97 for car insurance. After a DUI, Knoxville drivers can expect to pay $532.01 more a year, an increase of 52.16%, for car insurance premiums. 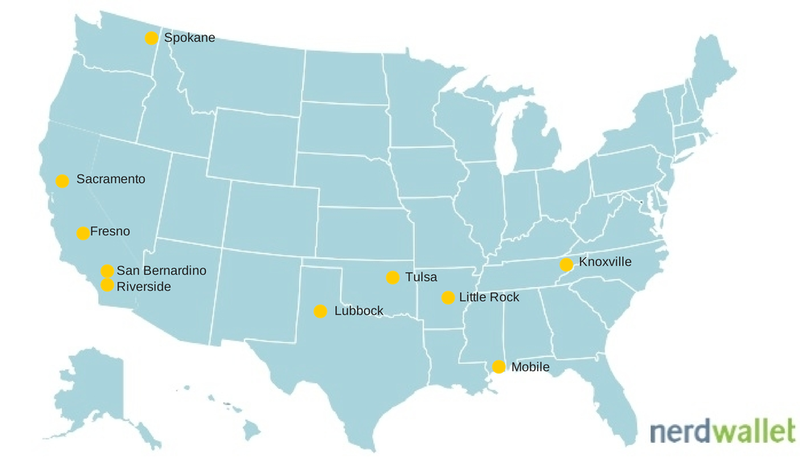 Fresno is the largest city to make the top 10. With 80 alcohol-related car accidents from 2010 to 2012, Fresno had more than twice as many fatal alcohol-related car accidents per capita than the national average. On average, Fresno drivers will pay 137.87% more a year for car insurance after they receive a DUI. The average Fresno driver pays $887.93 for car insurance each year, but that will increase to $2,112.10 after a DUI. Spokane is the only city in the Pacific Northwest to make the top 10. From 2010 to 2012, Spokane recorded 30 fatal alcohol-related car accidents. Tacoma, another city in Washington with a similar population, was much farther down the list: It was No. 69 with 13 fatal alcohol-related car accidents in that same time. Once convicted of a DUI, drivers in Spokane can expect their car insurance rates to increase from an average of $834.91 to $1,298.96. This 55.58% increase is less than the national average of 75.30%. Sacramento is the fourth California city to make the top 10. From 2010 to 2012, Sacramento recorded 66 fatal DUI crashes. For a city of 460,000, this was about 0.1412 alcohol-related fatal car accidents per 1,000 residents. On average, with a yearly cost of $1,042.58, Sacramento residents pay slightly less for car insurance than the national average. However, annual car insurance premium increases after a DUI are much higher in Sacramento than for the rest of the country. The typical Sacramento driver can expect to see their annual car insurance premium go up 138.14% after a DUI. Little Rock had almost twice as many alcohol-related fatal car accidents per capita than the national average. From 2010 to 2012, the city had 27 alcohol-related fatal crashes, an average of nine a year. After receiving a DUI, Little Rock drivers can expect their car insurance premiums to increase by about 50%. The average Little Rock driver pays $1,241.23 for car insurance every year, and after a DUI, a driver can expect their yearly premium to go up to $1,857.31. All motor vehicle crash data comes from the National Highway Traffic Safety Administration. Population data comes from the 2010 U.S. Census. To determine average insurance premium increases, we received quotes for eight driver profiles: 27-year-old single men and women, and 40-year-old married men and women each driving either a Toyota Camry or a Ford Escape. 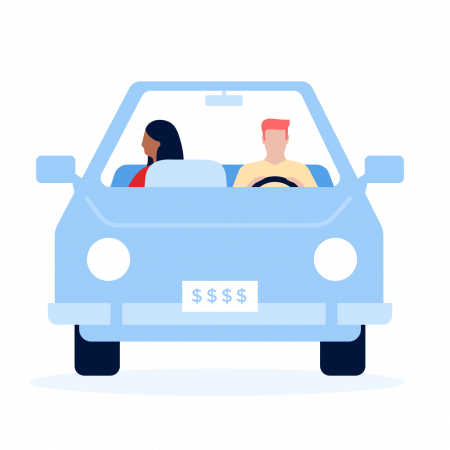 For the driver profiles, we picked each city’s three cheapest car insurance quotes — before and after a DUI — to mimic consumer behavior and to determine our overall average. In our study, we use preferred ZIP codes only, so three Nevada cities — Spring Valley, Sunrise Manor and Paradise — were left off the list. The actual insurance increases you face will vary depending on your insurance carrier, your location and other factors. Note: The total number of alcohol-related fatal crashes listed below may differ from those reported by a city’s local police department. For most cities, FARS data incorporates data from multiple agencies, not just local police departments.